This powerful book and audio lesson will expand your knowledge of not only the familiar "V" dominant 7th, but all of the secondary dominant 7ths that can be found in major and minor keys. Join Don Mock as he builds "master scales" for each dominant 7th and shows you the best voicings and the theory behind how they function. You'll also explore the subject of extensions and alterations that can be added to dominants and the two basic ways dominants operate which are "static" and "functioning." You'll play them in progressions and tunes and learn sample solos that demonstrate the correct scales, arpeggios and melodies for the various dominants. Discover why the study of dominant 7th chords will offer you the "keys to the kingdom" for truly understanding the workings of music. This one magical little chord gives music it's movement, energy and tension. 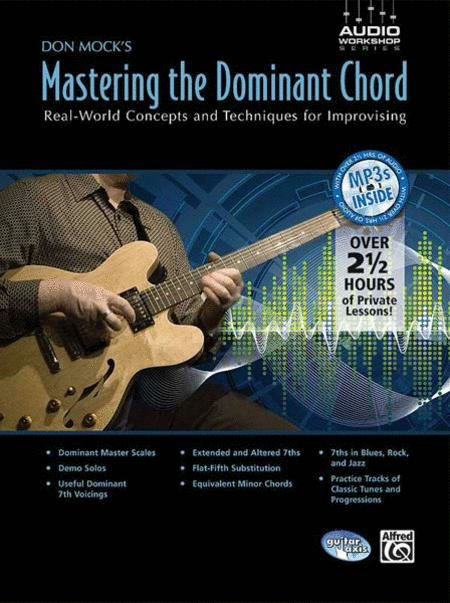 Knowing how dominants work will also greatly improve your dealings with other chord types including major and minors.